Looking to get the most out of your stored natural energy? Then you’ve come to the right place. We at Natural Energy USA now offer the Whole House Battery, an innovative solar battery back-up system that will not only help you get the most out of your stored natural energy, but will also give you back-up power in case of an electrical outage at your home. Here are just some of the benefits associated with the Whole House Battery. Natural Energy USA is incorporating a new whole-house lithium battery system that can lower your solar system’s costs as much as 60 percent. Due to its increased storage capacity, you’ll be able to generate and save more power, enabling you to save a large amount on your energy bill. In addition, several California state rebates are available if you install this solar-energy technology. For example, our Whole House Battery system is eligible for a $5,000 rebate from the state. The state also offers Solar rebates, which means if you install Solar panels in conjunction with our Whole House Battery, your cost to install both is less than $1,500 out of pocket. With our Whole House Battery system, you will see incredible energy savings, and your home will be self-sustaining and less dependent on the regular electricity provider. 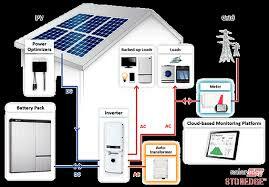 Additionally impressive is the fact that the system also works as a back-up power source. You can store up to 10 extra hours of electricity, which will come in handy if the standard power ever goes out. Thanks to the back-up battery, you can power everything in your home easily and dependably, including all major appliances. When every other house on your block is stuck in the dark, imagine the practicality and convenience of having lights and power for another 10 hours! No net metering is needed and there is no interruption in power if your electricity goes out. The system is reliable, and provides the lowest cost for power possible. Natural Energy USA has been providing premium solar services to San Diego County and the Las Vegas area since 1977. We’ve put our 40 years of knowledge and expertise to work for you, and our breakthrough lithium battery technology is one of the results. In addition to our solar electric services, we also offer unbeatable prices on solar pool and hot water systems. For a limited time only, Natural Energy USA is offering our Whole House Battery free of interest, with no down payment, or payment of any kind required for the first 12 months. The battery system also comes with a 10-year warranty. Call now to take advantage of this great deal. Contact your local Natural Energy representative today for more information about the Whole House Battery or visit www.naturalenergyUSA.com. We have an existing 17 panel solar system tied into the grid and are interested in getting a whole home battery back up. How much would a battery back up cost with installation? Property is 2013 square feet single story in Eastvale.